A free copy of the e-book can be obtained by clicking here. A leaflet which includes the recommendations and key findings is also available here. 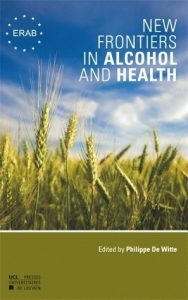 To mark its first seven years, ERAB has published a book, “New Frontiers in Alcohol and Health”, edited by Professor Philippe De Witte. There are five main chapters written by members of the ERAB Advisory Board. Each presents the research funded by ERAB with its added value in the context of the body of knowledge in that area. The book can be obtained on line at a cost of €16.50 for a paperback and €11.00 for a pdf in English or in French. A leaflet summarising the contents of the book has also been produced. Click here for the pdf or send your name and address to info@erab.org to receive a printed copy.